Soon after the House reassembled at noon after the first adjournment over the issue, Congress leader Mallikarjun Kharge read out a transcript of a taped conversation between a senior BJP leader and the son of a Janata Dal-Secular MLA that was released by Karnataka Chief Minister H.D. Kumaraswamy on Friday. 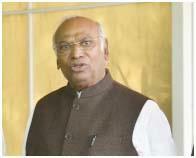 Kharge alleged that the BJP was trying to topple the state government by horse-trading. "One MLA of my parliamentary constituency was given assurance by a top BJP leader. They are indulging in horse-trading." Senior JD-S leader and former Prime Minister H.D. Deve Gowda said the BJP had earlier launched "Operation Kamala" in 2009 also to poach Congress legislators. He demanded that the government bring a law to stop such operations. "Such incidents shouldn't happen. That year, as many as 10 ministers resigned and the government fell," he said. Rejecting the charges, Union Minister D.V. Sadananda Gowda dubbed the allegations as "baseless". "In Karnataka, there is a big internal fight between the Congress and the JD-S. There is grouping in Congress itself. One of their MLA's was beaten by their own party colleague and was hospitalised for 10 days. "Everything uttered by Kharge and Gowda is false," he said. Soon after the Minister's response, Congress members trooped near the Speaker's podium and started sloganeering. Telugu Desam Party (TDP) members were already protesting in support of their demand for a Special Category Status for Andhra Pradesh. Speaker Sumitra Mahajan urged the members to return to their seats and called Congress' Veerappa Moily to speak on the budget. To this, Kharge said Moily will participate in the budget discussion but the issue raised by them was not properly addressed. In protest, the Congress members walked out of the House. Earlier, the Question Hour witnessed a washout over the same issue.